India’s Mobile subscriber growth does not stop for anything or anyone – It is kind of become mundane to report such impressive numbers month after month. I have been reporting TRAI number for nearly 2 years now, and except for probably couple of months, the growth numbers have never been less than 10 million a month. Now coming back to July numbers released today by TRAI – Wireless growth numbers are impressive as ever, while wireline and broadband numbers are equally dismal. Total Mobile Subscribers in India have now reached 652.42 million as compared to 635.51 in June 2010 registering a growth rate of 2.66 percent. The numbers for Wireline subscribers continued to decrease with 35.96 Million at the end of July 2010 as compared to 36.18 Million in June 2010. 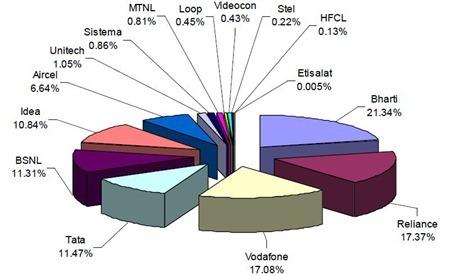 Total Broadband subscribers in India have now reached 9.77 million as compared to 9.45 million in June 2010, a growth of 3.39 percent over previous Month. Bharti grew the most with mobile subscriber additions of 15.37 percent, followed by Reliance (14.84 percent) and Vodafone (14.21 percent). First half of this year had seen Tata growing strongly, thanks to innovative pricing plans of Tata Docomo and aggressive advertising campaigns. However, their growth seems to have slowed down a bit who grew 4th fastest with 13.69 percent followed by Idea at 11.01%. 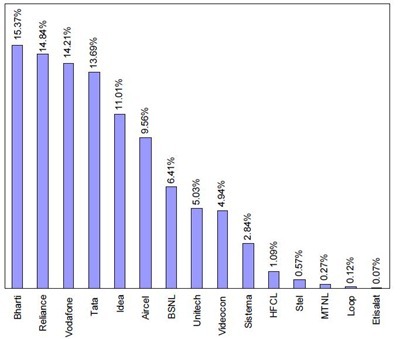 Last 3 months has seen Bharti increasing its gap at the top, who are now clear 4 percent ahead of Reliance and Vodafone, both of whom have been running neck to neck. What compelled Bharti Airtel exit bulk SMS business? Sagar’s question on multiple SIM data, prompts me to question the addition of 16.92 million additional subscribers. Are multi SIM holders being tracked? Is teledensity calculated after excluding the same? And what is the growth opportunity considering the plethora of dual SIM handsets in the market? The subscriber base INCLUDES multiple sim as well…i.e: if a user has 2 numbers that means it is counted as 2 subscribers…and thats the reason why some of the metros have more than 100% tele-density !! Thats Great news for telecom Sector but still any chance to change in growth rate due 3g implementation in India and is it same scenario after five years down the line please let me know if anybody have a idea on it where this sector move after five or ten years. Agree. Also, any data on what is the break up of people having single SIM Vs people with multiple SIM? Will be interesting to know. Surprised to see Bharti get 15% increase. They did not any big campaign or advertising, still got highest growth. Anybody, any clues? This is my guess, but not sure abt it.. It must be to do with the footprint they have pan-India…They have bigger network and reach as compared to Reliance, Vodafone and Idea..